The cliché of the mostly tasteless and umpteen times distilled schnapps from potatoes has by no means been overcome completely (apart from the fact that a large part of the vodka sold globally is not made from potatoes at all), but somewhat conciliatory tendencies can be observed at the periphery of the vodka market and also in the so-called premium sector. On the one hand, there is a small trend towards matured, older vodkas which have not undergone multiple distillation and which actually develop a distinguished taste of their own due to the aging and maturing process. On the other hand, the “flavored vodka” sector is discovering more and more options for influencing the taste beyond artificial flavorings with natural infusions. Moreover, it is precisely this second trend that sometimes makes me smile when some friends of New Western Dry Gins apologetically praise the advantages of the genus while at the same time looking down on vodka. Because in my eyes some of those New Western Dry Gins are more flavored vodka than gin. Nevertheless, that’s another question of its own. Anyway, today’s bottle can clearly be assigned to the latter development trend. 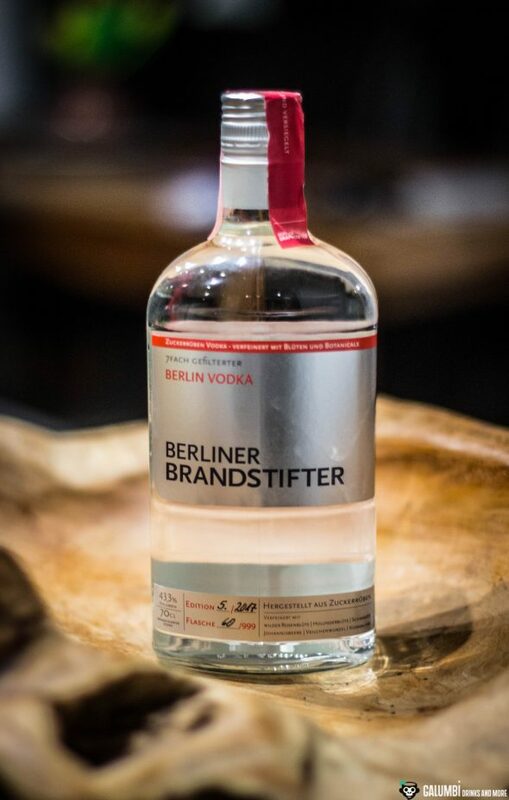 Because the Berliner Brandstifter Berlin Vodka from the house of Berliner Brandstifter by Vincent Honrodt follows just that path. The company that also produces gin and Korn schnaps, produces a vodka which does some things differently (although not all things). For me, the announcement “5-fold distilled, 7-fold filtered” is less appealing for example, because it sounds exactly like those vodka clichés I’m all but fond of. 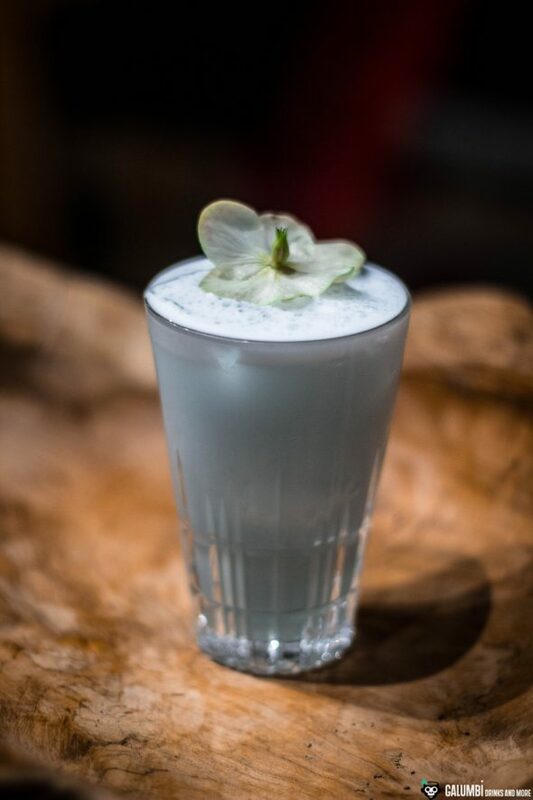 However, the fact that Berlin Vodka is based on sugar beets and has also been infused with flowers and botanicals makes me sit up and take notice. To be honest, I do not expect this bottle to be a sole revelation (at least for me), but I expect it to be a welcome alternative to many New Western Dry Gins, which are shooting up like mushrooms since many years. 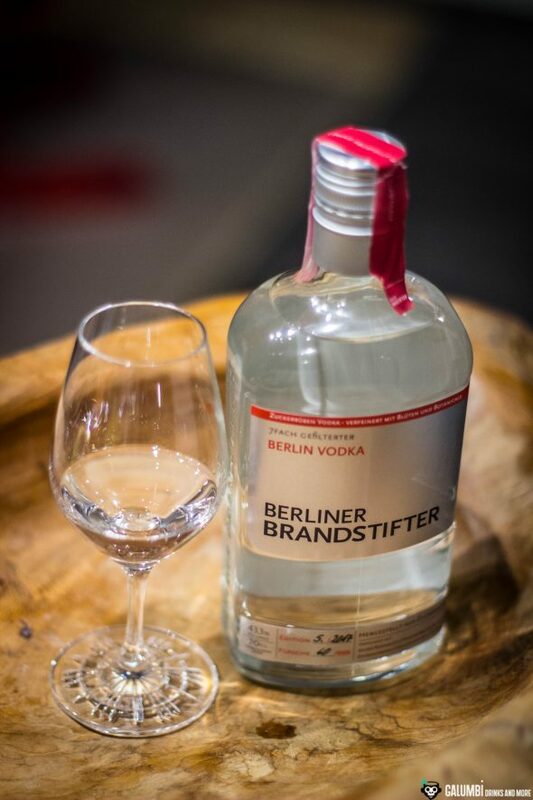 The Berlin Vodka, filled into the bottle with an ABV of 43.3%, was made with a mixture of botanicals which, according to the manufacturer, are supposed to capture the scent of wild Berlin city gardens. Well, on the scale of marketing stories, the pointer is almost going through the roof, but be that as it may: let the vodka speak for itself! Aroma: First, I can find surprisingly little here, so I have to directly ask myself whether I’ve once again chosen a wrong way to approach vodka. The flower infusion remains very subtle and should not be confused with what is commonly known as flavored vodka. With time, however, subtleties crystallize out, so I definitely find fine berry tones of raspberries and currants, perhaps also a hint of cherry. Behind them follow incredibly light floral tones that are almost so fleeting that you won’t notice them. 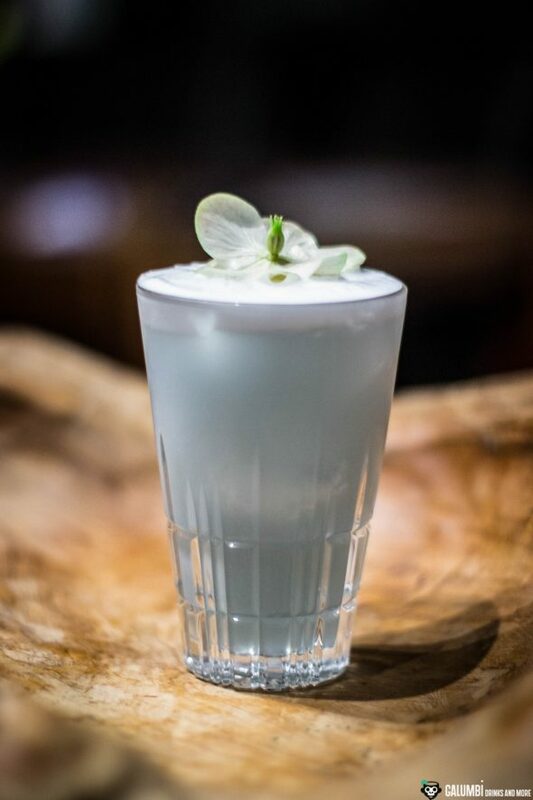 The vodka itself remains very reserved, with a touch of minerality and an idea of fresh curd. Taste: On the palate, I find an interesting, mineral sweetness, which shortly afterwards changes into a powdery sugar with very fine fruit notes. Again there are berries (raspberries and currants, maybe some strawberries) and a little rock salt as counterpoint. The Berlin Vodka is mild, but also very reserved in its overall appearance. No question: there’s a lot more to it than nothing. But also not so much that I could come to a really enthusiastic conclusion. Well, I will not become a passionate vodka lover anymore. I must confess: Barrel-aged vodkas are by far my favourite representatives, but at least there is much more to be found here than in classic vodkas which have been distilled to death. 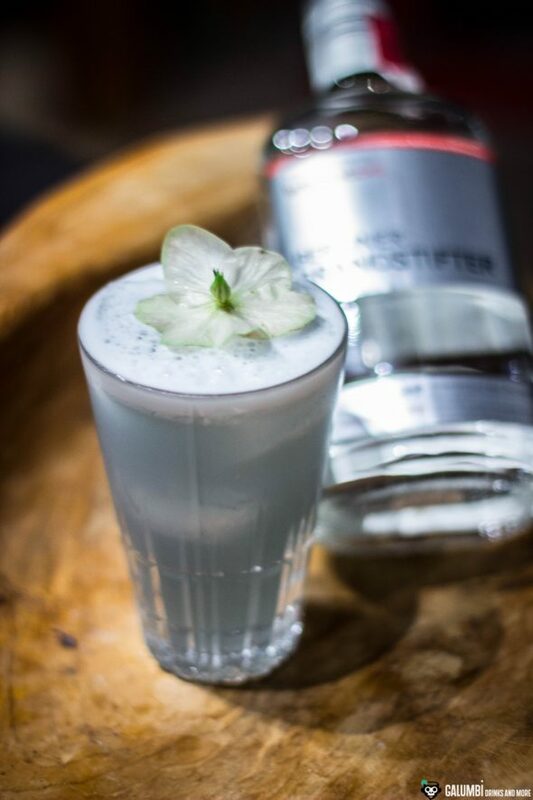 Right from the start, I wanted to emphasize the flowery nuances of the Berliner Brandstifter Berlin Vodka and therefore created a drink with the rhyming name “Flower Sour” (I’m sure the name already existed somewhere out there). 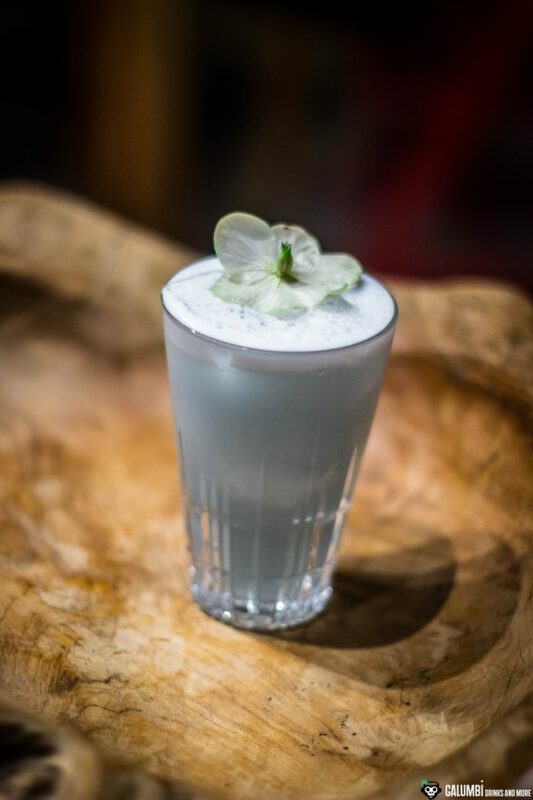 Basically, this is a vodka sour made with eggwhite (the Boston variant), which is raised to a completely different level with a bit of cherry bitters, a hint of raspberry eau-de-vie and cream violet. Floral, fruity, flowery and still quite fine in taste. Moreover, it offers a nice and enchanting sky-blue colour that makes you long for spring. Cheers! Preparation: First, mix all ingredients in a shaker without ice and do a “dry shake”. Finally add ice and shake vigorously. Then strain into a glass filled with fresh ice cubes.